Albert Pinto Ko Gussa Kyon Aata Hai? is a film that has long been a favourite of teenagers playing dumb charades. It used to be mine, too. When I first heard the name of the film (someone also mentioned that it was the longest name of any Hindi film), I thought I was being fooled. Upon confirmation, it seemed really strange to me that a film should have such a weird name. Later, I inferred, with the reductive simplicity of a 12-year-old, that the film might be a comedy, because another film, with a long name (Chala Murari Hero Banne) was, for most part, a funny film. Until I had seen the film, I assumed that it would be a happy no-brainer, in which the protagonist would keep doing silly things owing to his touchy behaviour. At one point, I even thought that this might be a jibe on Amitabh Bachhan, who was then known as the Angry Young Man of Indian cinema. Albert Pinto Ko Gussa Kyon Aata Hai? film poster. When I finally watched the film a few years ago, I realised in the first 15 minutes that this was not a “funny film”. It seemed boring, and had a very theatre type feel to it—and not the kind of theatre that plays Macbeth, but the kind of theatre which caters to the nukkad but has dreams of making it big. There was a specific reason for this—most of the crew members, except for Naseeruddin Shah, have a very affected, tired kind of feel to themselves. They seem worn out. Perhaps they were meant to be. But given that many of these actors were wonderful theatre artists, I had greater expectations from them. I felt that their expressions were inscrutable. Examples will follow, but first a little bit about the premise of the film. The film is about blue-collar workers in Mumbai with poor living standards. The protagonist, Albert Pinto, is angry—about a lot of things, just not so much about the main issue. He is, in the beginning of the film, quite ambivalent—in fact, unfeeling—about class differences and attempts of workers to demand higher wages through strikes. When the topic is first broached by his father, in a sort of a declaration of participation in a strike, Albert rebuffs his father stating that they have enough to survive. But as the film progresses, Albert becomes supportive of his father’s decision to participate in the strike. Of all the things that Albert is angry about (his girlfriend’s lecherous colleague, younger brother’s guitar playing habit, a co-worker’s good-humoured teasing), the central theme of the film, gets attention only towards the end. The actors (despite being talented and well-trained), do not act credibly. It seems that in an effort to make the film look real, they almost forgot that to act is the primary task. In a scene in which a man asks Smita Patil (who works as a salesgirl in a saree store) to wear a saree—the intent of the act is sexual hinting—she gets up, confronts the man (very ineffectively) and tells him that she is physically handicapped. The limping act is so ineffective that rather than evoking any feeling of empathy for her, or disgust for him, it simply leaves us disinterested. Why? Because the scene has no particular preamble, like many others throughout the film. After the shot is over, we wonder how it was supposed to impact us. 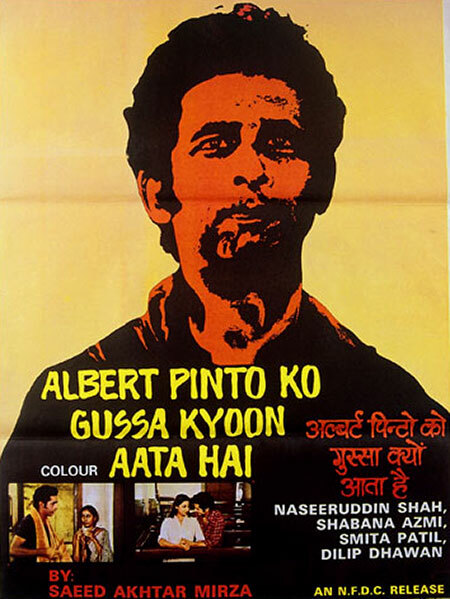 Similarly, another shot, in which Naseeruddin Shah gets angry at his girlfriend (Shabana Azmi) because a colleague at work asked her out for a film makes Albert’s reaction look like a rant, rather than anger. Albert seems to be irritated and frustrated—not angry. Every time we hear him argue, more than the powerful thrust of a diatribe that provokes thought, we hear a frustrated rollicking, which lacks force and seems unconvincing. The plot of the film is strewn with incidents that seem irrelevant or unexplained. For example, why does Albert go and meet laid-off workers? Was it to empathise with them? Or was it to plan a revolution? We will never know. The film ends, and we see blazing torches being carried by a crowd. Are they planning to burn the factory? Is that anarchy? These other questions aside, the film is, more than anything, unable to express the significance of its long title. Come to think of it, could it be a rhetorical question? Maybe Albert is not so angry after all. Maybe he’s just irritated, or insecure, or jaded—just like I will be henceforth, before having expectations from any film that belongs to the genre of parallel cinema.